An unclassified aspect of the mission codenamed ‘Zuma’ is that SpaceX will also attempt to recover the 16 story tall first stage booster with a soft landing on the ground back at Cape Canaveral Air Force Station. So expect some extremely loud sonic booms to rock the space coast region about eight minutes after liftoff. Zuma is a total mystery, to the delight of the spymasters. One of the very few tidbits of information we can absolutely confirm (and not deny) is that the clandestine and ownerless ‘Zuma’ Spysat is now targeted for a nighttime launch on a SpaceX Falcon 9 rocket from seaside Launch Complex 39A at NASA’s Kennedy Space Center in Florida during a lengthy 2 hour window. We can also confirm that the launch contract was arranged as a commercial enterprise under the auspices of Northrop Grumman Corporation – as a means to significantly slash launch costs for whatever U.S government entity is responsible for Zuma. That goal is completely in line with SpaceX founder and CEO Elon Musk’s entire company-wide goal in developing the Falcon and Dragon family of rockets and spaceships. “The U.S. Government assigned Northrop Grumman the responsibility of acquiring launch services for this mission,” Lon Rains, Northrop Grumman Director of Communications, told Universe Today. The launch window at pad 39A opens at 8 p.m. EST (0100 GMT). It extends for two full hours until 10 p.m. EST (0300 GMT). “SpaceX is now targeting Thursday, Nov. 16 for launch of the Zuma mission,” said SpaceX spokesman John Taylor. You can watch the launch live on a SpaceX dedicated webcast starting about 10 minutes prior to the 8 p.m. EDT (0100 GMT) liftoff time. The launch window for the newly built booster extends for two hours until it closes at 10 p.m. EDT (0300 GMT). The weather outlook is rather favorable along the Florida Space Coast with a 90% chance of favorable conditions at launch time according to U.S. Air Force meteorologists with the 45th Space Wing Weather Squadron at Patrick Air Force Base. The primary concerns on Nov. 16 are only for the Cumulous Cloud Rule. The odds get even high at greater than 90% favorable for the 24 hour scrub turnaround day Nov 17. The launch window remains the same on Nov 17 at 8 to 10 p.m. Furthermore the two stage 229-foot-tall (70-meter-tall) Falcon 9 rocket was raised to vertical launch position later today Wednesday afternoon Nov. 15 – so everything seems to be in place for a Thursday evening launch attempt. However we don’t know anything about the ‘Zuma’ payloads characteristics and vital statistics – despite the seemingly endless leaks streaming out of Washington these days. “The Zuma payload is a restricted payload,” Rains told me. So quite naturally we’re all curious for any nugget of information from which we might draw some reasonable conclusions based on the scientific method of analysis. “Northrop Grumman is proud to be a part of the Zuma launch,” Rains added. One juicy tidbit we do know is that it is intended for launch to low Earth orbit (LEO). “It will be launched into Low Earth Orbit,” Rains informed me. Low Earth Orbit extends upwards to roughly 1200 miles altitude and includes the ISS orbit for example at approx. 250 miles. In addition to launch services Northrop Grumman Corporation may have manufactured the Zuma payload – although that’s not even known. SpaceX has successfully launched a pair of diverse national security payloads this year already with identified customers. Namely the NROL-76 surveillance satellite for the NRO on May 1, 2017 and the OTV-5 military spaceplane for the USAF on Sept. 7. The long launch window should significantly increase the chance of launching Zuma and removing any errant or intentional boaters and flyers from the restricted airspace around the launch pads. That’s increasingly important these days given that a pair of critical NASA science mission this week and in the past 3 days were scrubbed near T Zero on both US East and West coast launch pads in Virginia for the Orbital ATK Antares rocket and in California for the ULA Delta II rocket. ‘Homeless’ government satellites not even claimed by the NRO are rather rare. 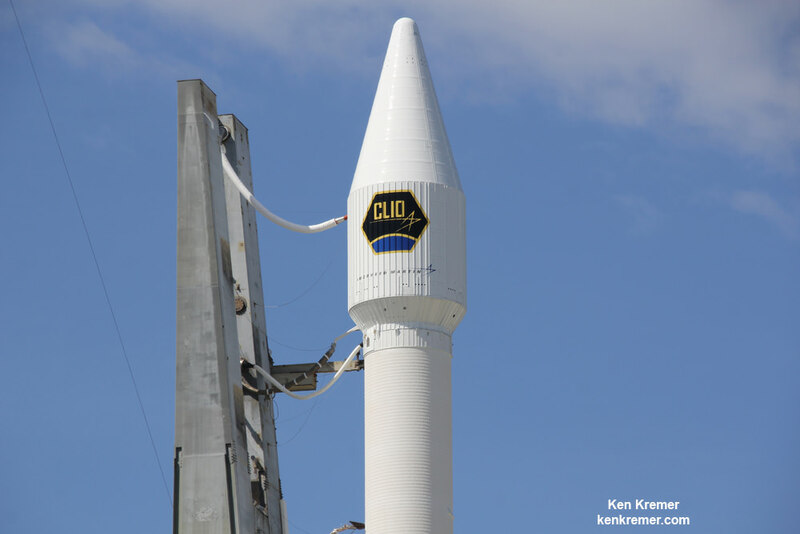 A recent example is Clio, an unclaimed mission from Lockheed Martin. Clio launched at night on a ULA Atlas V on September 16, 2014 from Space Launch Complex-41 on Cape Canaveral Air Force Station, Fl. Watch for Ken’s continuing onsite coverage of SpaceX Zuma, KoreaSat-5A & SES-11, ULA NROL-52 and NASA and space mission reports direct from the Kennedy Space Center and Cape Canaveral Air Force Station, Florida. KENNEDY SPACE CENTER, FL – Despite suffering a significant engine testing “anomaly” and fire during test protocols with a Merlin engine that powers both stages of SpaceX’s Falcon 9 rocket, the Elon Musk founded company is forging ahead with an ambitious year end launch schedule that commences this week with blastoff of the secretive Zuma mission on Wednesday evening, Nov. 15. Clearly Musk & Co. feel it is safe to proceed. While preparing to conduct a test firing of the most advanced Merlin engine of the type that will launch astronauts to the International Space Station (ISS) as soon as next year, something sparked the outbreak of a fire in a test bay earlier this month on a SpaceX engine test stand at their rocket development facility in McGregor, Texas, SpaceX spokesman John Taylor confirmed to Universe Today. The resulting fire in a McGregor, Texas test bay apparently did not involve an engine explosion as technicians were getting ready to conduct an actual hot fire test. The fire may have occurred as a result of a leak while setting the Merlin engine up on a test stand during pre-test procudures. Details have not been released. “We do not expect this to have any impact on our launch cadence,” SpaceX spokesman John Taylor told Universe Today. Since the fire involved the most advanced Block 5 version of the Merlin rather than the currently used Block 4 version, SpaceX engineers and management decided they can safely and responsibly move forward with the upcoming jam packed schedule of Falcon 9 and Falcon Heavy launches, while simultaneously continuing the anomaly investigation. 2017 has been a banner year thus far for SpaceX involving 16 missions to date that ties a ULA record established in 2009. The most recent launch took place of Oct. 30 delivering KoreaSat-5A to its intended orbit – along with a magnificent soft landing and recovery of the first stage booster on an oceangoing platform that floated ‘back in town’ days later. The fire took place on Nov. 4, as first reported by the Washington Post on Nov. 9. “On November 4, SpaceX experienced an anomaly during a Qualification test set up of a Merlin engine at our rocket development facility in McGregor, Texas,” SpaceX spokesman Taylor told me. With a slew of critical launches looming starting tomorrow, Nov. 15, SpaceX had to decide quickly whether to pause or move ahead with their final planned launches of 2017 – numbering at least 4 or more and possibly including the long-awaited and long-delayed mammoth Falcon Heavy. It utilizes 27 Merlin 1D engines in the first stage cores. SpaceX has decided to move ‘Full Speed Ahead’ – after an initial review of the fire incident which is still ongoing. Seemingly, the fire happened during the set up period for the Merlin engine before the actual qualification engine test had begun. A leak may have occurred around the test stand and caused the fire to brake out. Although 2017 has been a great year, SpaceX has suffered two catastrophic rocket accidents in 2015 and 2016 as a result of unrelated failures traced to the second stage which slowed down the launch pace as engineers raced to identify and rectify the root causes. Engineers were conducting a pre-test operation when the test bay fire broke out. It may take a few weeks or more to repair the test stand and resume hot fire testing. SpaceX has notified customers such as NASA, the FAA and the USAF about the incident – for which SpaceX plans a Dragon cargo resupply mission to the ISS launching as soon as Dec. 4 from Cape Canaveral Air Force Station, FL. Fortunately there were no injuries to any personal. “No one was injured and all safety protocols were followed during the time of this incident,” Taylor explained. The Merlin engine about to be tested involved the most advanced type known as the Block 5 version that will be used to propel astronauts to orbit inside the SpaceX Crew Dragon. The Falcon 9 is currently powered by 9 Merlin 1D engines of the Block 4 version. Altogether they generate a combined 1.7 million pounds of liftoff thrust. SpaceX can continue launches with the less advanced Merlin 1D version because testing of Block 4 is still happening. Meanwhile launch preparations are in full swing for Wednesday’s nighttime blastoff of the mysterious Zuma mission for the U.S. government at 8 p.m. EST on Nov. 15 from pad 39A on NASA’s Kennedy Space Center. PORT CANAVERAL/KENNEDY SPACE CENTER, FL – ‘The SpaceX boosters back in town! The boosters back in town!’ paraphrasing the popular lyrics of the hit single from Irish hard rock band Thin Lizzy – its what comes to mind with the speedy cadence of ‘launch, land and relaunch’ firmly established by CEO Elon Musk’s hard rocking crew of mostly youthful rocket scientists and engineers. Barely three days after successfully launching the commercial KoreaSat-5A telecomsat on Monday Oct 30, the SpaceX Falcon 9 first stage booster that did the heavy lifting to orbit generating 1.7 million pounds of liftoff thrust – arrived back in town Thursday, Nov. 2 or more specifically back into Port Canaveral, Florida. “Guess who’s back in town?” – the song continues – well its the Falcon 9 that reached the edge of space on Halloween Eve while traveling several thousand miles per hour, flipped around like a witches broom and carried out a pinpoint propulsive and upright touchdown of what amounts to a stick on a board in the middle of the Atlantic Ocean. Just amazing! 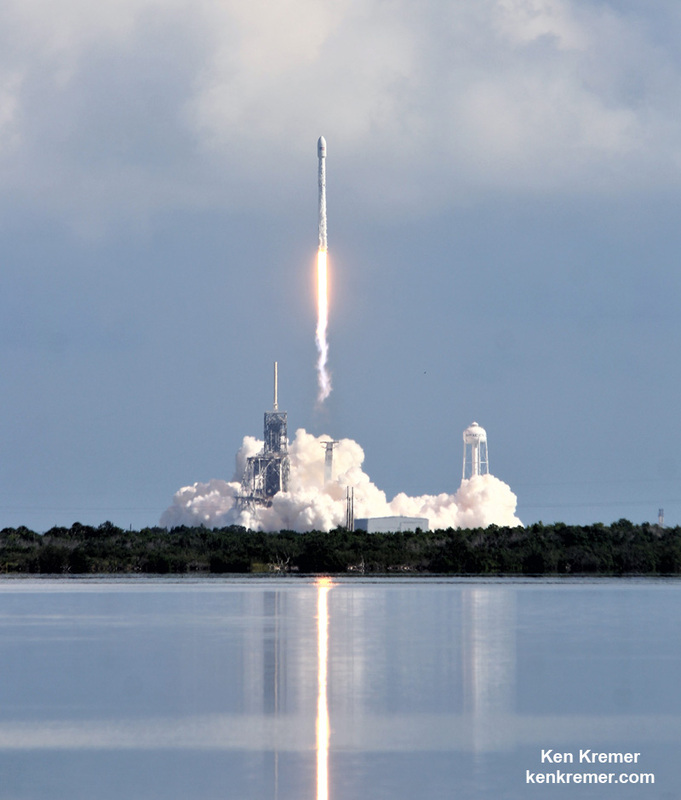 Floating atop the football field sized platform upon which it soft landed 8.5 minutes after the two stage Falcon 9 lifted off at 3:34 p.m. EDT (1934 GMT) from seaside Launch Complex 39A at NASA’s Kennedy Space Center in Florida. The 16 story tall booster arrived back into the mouth of Port Canaveral late Thursday at sunset – as witnessed up close by myself and several space journalist colleagues. Check out our expanding photo and video gallery compiled here of the boosters arrival into Port on the OCISLY droneship. The gallery is growing so check back again for more up close looks of the ocean arrival, sailing and docking. Furthermore the four landing legs that made the landing sequence possible – have already been quickly detached by workers this afternoon, as shown here with additional incredible up close imagery. Plus also featured are lots of imagery of the booster sailing through the narrow channel of Port Canaveral – often past seemingly oblivious spectators and pleasure craft who have no idea what they are seeing. As well as imagery of work crews processing the booster for the eventual return back onto base. The Hawk was accompanied by a small naval flotilla of commercial vessels SpaceX leased for the occasion. In fact with each booster return the SpaceX technicians are progressing faster and faster carrying out the booster processing involving safing, cap and line attachment, leg removal, and lowering the booster for horizontal placement on a specially outfitted lengthy multi-wheeled trailer for hauling back to SpaceX hangar facilities on the Kennedy Space Center and Cape Canaveral Air Force Station. After arriving in port, and sailing through the channel for about 45 minutes the SpaceX flotilla carefully and methodically edged the droneship closer to shore and docked the vessel last night – and the crews got a well deserved rest as the booster basked in the maritime glow producing beautiful water reflection vistas. The team wasted no time this morning. At the crack of dawn they began the task of attaching a hoisting cap to the top of the first stage. Shortly after 9 a.m. EDT they craned the booster off OCISLY and onto a restraining pedestal platform on land. The techs were working fast and making mincemeat of the booster. They detached the four insect like legs one after another in an operation that looked a lot like a well thought out dissection. One at a fime over a period about roughly two hour the workers methodically unbolted and detached the legs in 2 pieces. First they they slung a harness around the upper strut and removed it with a small crane. Then they did the same with the lower foot pad. Altogether the land leg amputation operation took about 2.5 hours. The now legless Falcon 9 stands erect. It will soon be lowered and placed horizontally for transport back to the base. It has been barely two weeks after the last dogeship landed booster arrived back into port in mid-October for the SES-11 launch on October 11 and sunrise port arrival on October 15. OCISLY which stands for “Of Course I Still Love You” left Port Canaveral several days ahead of the planned Oct. 30 launch and was prepositioned in the Atlantic Ocean several hundred miles (km) off the US East coast, awaiting the boosters approach and pinpoint propulsive soft landing. The booster was outfitted with four grid fins and four landing legs to accomplish the pinpoint touchdown on the barge at sea. To date SpaceX has accomplished 19 successful landings of a recovered Falcon 9 first stage booster by land and by sea. Watch for Ken’s continuing onsite coverage of SpaceX KoreaSat-5A & SES-11, ULA NROL-52 and NASA and space mission reports direct from the Kennedy Space Center and Cape Canaveral Air Force Station, Florida. KENNEDY SPACE CENTER, FL – With the stunningly beautiful Halloween eve liftoff of the commercial KoreaSat-5A telecomsat payload from the Florida Space Coast, SpaceX matched competitor United Launch Alliance’s (ULA) single year launch record of 16 missions – and the blastoff record breaker is on tap in just 2 weeks time! In fact several additional Falcon 9 missions are planned before the end of 2017 that could bring the year’s accumulated total to an incredible 20 or more liftoffs – if all goes well from SpaceX’s coastal launch bases in Florida and California. Hawthorne, Ca based SpaceX tied ULA’s 16 mission record on Monday, Oct. 30, when their Falcon 9 blasted off mid-afternoon carrying the private KoreaSat-5A telecomsat mission right on time at the opening of the launch window at 3:34 p.m. EDT (1934 GMT) from seaside Launch Complex 39A at NASA’s Kennedy Space Center in Florida. Check out the exciting gallery of SpaceX KoreaSat-5A launch imagery and videos compiled here from this author and several space media colleagues. And check back often as the gallery grows! ULA established their one year record of 16 missions in 2009 with the launch of NASA’s Wide-field Infrared Survey Explorer (WISE) spacecraft by a Delta II on Dec. 14, 2009. Altogether ULA’s 2009 launch manifest included five Atlas Vs, eight Delta IIs, two Delta IVs and the first Delta IV Heavy carrying an NRO payload. ULA is a 50:50 joint venture owned by Boeing and Lockheed Martin – now in fierce competition with SpaceX founded by billionaire and CEO Elon Musk who has won numerous commercial, government and military contracts by dramatically slashing launch costs. Adding to the drama of SpaceX’s record breaking next Falcon 9 launch is that it’s a secret mission planned for about Nov. 15 – and its codenamed ‘Zuma’ – – but about which we know basically nothing. To date 12 of this year’s 16 Falcon 9’s have launched from Launch Complex 39A at the Kennedy Space Center, Fl. After lying dormant for six years, Pad 39A has been repurposed and refurbished by SpaceX from its days as a NASA shuttle launch pad. NASA’s last space shuttle launch took place in July 2011 with the STS-135 mission to the International Space Station. In addition to being SpaceX’s 16th launch this year, KoreaSat-5A was the 2nd one by the new space firms Falcon 9 rocket from Florida’s Spaceport in October, and the third overall in October counting another liftoff from Vandenberg AFB, Calif. – thus maintaining an absolutely torrid launch pace on the way to the record tying mission. Monday’s mission also marks the first for a Korean satellite customer. The nearly two ton commercial KoreaSat-5A satellite will provide Direct to Home (DTH) broadcasting, maritime, internet and other services to the North Asian region centering around South Korea. Eight and a half minutes after liftoff the 15 story tall first stage booster nailed another rocket assisted touchdown on the OCISLY droneship pre-positioned several hundred miles off shore of Cape Canaveral in the Atlantic Ocean. Koreasat-5A was built by prime contractor, Thales Alenia Space, responsible for the design, production, testing and ground delivery. It arrived at the Florida launch base on Oct. 5 for integration with the Falcon 9 rocket. The 3,700 kg satellite is equipped with 36 Ku-band transponders and based on Thales Alenia Space’s new-generation Spacebus 4000B2 platform. It will replace Koreasat 5. The solar panels provide a payload power of approximately 6.5 kW. It will be positioned at 113° East and provide coverage for Indochina, Japan, Korea, the Philippines and the Middle East including Direct to Home (DTH) services. The first stage from October’s SES-11 launch arrived back into Port Canaveral, FL on top of the OCISLY droneship on Oct. 15. The SES-11 comsat launched on Oct. 11. KENNEDY SPACE CENTER, FL – SpaceX delivered a spectacular Halloween eve delight with today’s Falcon 9 launch of a Korean HDTV satellite that lit up the Florida Space Coast skies with a glow that delighted kids of all ages and ghouls alike and put an end at last for today to the atrocious wet and windy weather afflicting the Spaceport region. The SpaceX Falcon 9 blasted off mid-afternoon Monday Oct. 30 with the private KoreaSat-5A telecomsat mission right at the opening of the launch window at 3:34 p.m. EDT (1934 GMT) from seaside Launch Complex 39A at NASA’s Kennedy Space Center in Florida. Today’s mission marks the 16th launch by SpaceX this year, the 2nd this month by the new space firms Falcon 9 rocket from Florida’s Spaceport, and the third overall counting another liftoff from Vandenberg AFB, Calif. – thus maintaining an absolutely torrid and record setting yearly launch pace. The launch was broadcast live on a SpaceX dedicated webcast. Florida finally fulfilled its billing as the ‘Sunshine State’ with truly superb afternoon weather for Monday afternoon’s liftoff of a SpaceX Falcon 9 with its first Korean satellite customer – and the decent weather outlook looks like it will extend into Tuesdays Halloween trick or treating for the local kiddies and their imaginative costumes. The two stage 229-foot-tall (70-meter-tall) Falcon 9 rocket shined at sunrise this morning and throughout the countdown and fueling process fed the falcon with RP-1 and liquid oxygen propellant powering the rockets nine first stage Merlin 1D engines. Altogether the Merlin 1D engine delivered a powerful liftoff punch that was far more than a Halloween ‘boo’ as the engines ignited with 1.7 million pounds of liftoff thrust. As the Falcon 9 roared off launch pad 39A a rumbling thunder reverberated across the space coast region and beyond that brought broad smiles of glee to spectators faces packing local area beaches and hotels and quickly dispatched wicked ghouls to their graves. Trick or treaters will have a fine Halloween indeed following SpaceX’s thunderous rocket launch into picture perfect clear blue skies that were set of fire as the rocket vaulted off the pad and arched over eastwards to the African continent as it accelerated to the heavens. The SpaceX Falcon 9 successfully delivered Koreasat-5A to a geostationary transfer orbit (GTO). Satellite deployment took place as planned 35 minutes after launch as seen on the webcast. “Successful deployment of Koreasat-5A to geostationary transfer orbit confirmed,” said SpaceX. The launch was also accompanied by a successful attempt to recover the 156 foot tall first stage booster after completing its primary satellite delivery mission task. Choppy seas from Tropical Storm Phillipe made the sea landing even more challenging. SpaceX engineers guided it to a landing on the tiny OCISLY drone ship for an upright and intact pinpoint soft landing touchdown on the ocean going platform prepositioned off shore in the Atlantic Ocean – some 8 minutes after blastoff. OCISLY or “Of Course I Still Love You” left Port Canaveral several days ahead of the planned Oct. 30 launch and was prepositioned in the Atlantic Ocean several hundred miles (km) off the US East coast, awaiting the boosters approach and pinpoint propulsive soft landing. “Falcon 9 first stage has landed on the Of Course I Still Love You droneship.” announced SpaceX. A small fire broke out on the Falcon 9 atop the droneship after landing as seen on the webcast but it was quickly extinguished. The nearly two ton commercial KoreaSat-5A satellite will provide Direct to Home (DTH) broadcasting, maritime, internet and other services to the Asian region centering around South Korea. It has a 15 year design lifetime. KoreaSat-5A was built by Thales Alenia Space and launched by SpaceX under a commercial contract for South Korean operator KTSAT (a KT Corporation company) using a freshly built first stage booster. KTSAT is South Koreas sole satellite service provider. Of course North Koreans have no access to any of these services as they are forbidden under the regime of Kim Jong Un with severe penalties for any violators. The satellite was attached to the booster encapsulated in the nose cone last Friday after engineers successfully completed the routine but required static hot fire test of the first stage engines last Thursday, Oct 26. The 3,700 kg (8,160 lb) satellite is equipped with 36 Ku-band transponders and based on Thales Alenia Space’s new-generation Spacebus 4000B2 platform. It will replace Koreasat 5 launched a decade ago in 2006. Pad 39A has been repurposed by SpaceX from its days as a NASA shuttle launch pad. To date SpaceX has now accomplished 19 successful landings of a recovered Falcon 9 first stage booster by land and by sea. The KoreaSat-5A booster is expected back into Port Canaveral later this week – and the public can watch the sailing action. The first stage from this months SES-11 launch arrived back into Port Canaveral, FL on top of the OCISLY droneship on Oct. 15. The SES-11 comsat launched on Oct. 11. KENNEDY SPACE CENTER, FL – After seemingly endless bouts of damaging rain squalls and flooding, Florida is at last living up to its billing as the ‘Sunshine State’ with some superb weather forecast for Monday afternoon’s scheduled liftoff of a SpaceX Falcon 9 with its first Korean customer – on the eve of Halloween. SpaceX engineers are targeting the Falcon 9 for a mid-afternoon liftoff with the private KoreaSat-5A telecomsat mission for a window that opens at 3:34 p.m. EDT (1934 GMT) Monday Oct. 30 from seaside Launch Complex 39A at NASA’s Kennedy Space Center in Florida. The two stage 229-foot-tall (70-meter-tall) Falcon 9 rocket was raised to vertical launch position later Sunday afternoon. The launch will also be accompanied by an attempt to recover the first stage booster by soft landing on an ocean going platform prepositioned off shore in the Atlantic Ocean – some 8 minutes after blastoff. If all goes well, SpaceX will conduct their 16th launch this year and the 2nd this month by the new space firms Falcon 9 rocket from Florida’s Spaceport – maintaining an absolutely torrid and record setting yearly launch pace. Space enthusiasts and Halloween trick or treaters alike will surely enjoy the heavenly fireworks display. And to top that off the procedure to recover the rockets first stage has been described as riding a ‘witches broom’ in the middle of a hurricane since the 15 story tall stick has to flip around and fire its engines while traveling at several thousand miles per hour to place it on course for the droneship. The KoreaSat liftoff will also count as October’s third from the increasingly busy Florida Space Coast capping two earlier missions carried out by both ULA and SpaceX. KoreaSat-5A was built by Thales Alenia Space and is being launched by SpaceX under a commercial contract for South Korean operator KTSAT (a KT Corporation company) using a new first stage booster. The satellite was attached to the booster encapsulated in the nose cone over the weekend after engineers successfully completed the static hot fire test of the first stage engines on Thursday, Oct 26. You can watch the launch live on a SpaceX dedicated webcast starting about 10 minutes prior to the 3:34 p.m. EDT (1934 GMT) liftoff time. The launch window for the newly built booster extends nearly two and a half hours until it closes at 5:58 p.m. EDT (2158 GMT). The weather outlook is uncommonly excellent along the Florida Space Coast with a greater than 90% chance of favorable conditions at launch time according to U.S. Air Force meteorologists with the 45th Space Wing Weather Squadron at Patrick Air Force Base. The primary concerns on Oct. 30 are only for Liftoff Winds. The odds remain high at 90% favorable for the 24 hour scrub turnaround day on Halloween Day, Tuesday Oct. 31. Tropical Storm Philippe is not an issue and has moved north of the Bahamas and will continue moving northeastward at 30 mile per hour today says the AF. Temperatures will be cool however on Monday dipping into the 50s and 60s. The SpaceX Falcon 9 will deliver Koreasat-5A to a geostationary transfer orbit (GTO). After the 156 foot tall first stage booster completes its primary mission task, SpaceX engineers seek to guide it to a second landing on the tiny OCISLY drone ship for a soft touchdown some eight and a half minutes after liftoff. OCISLY or “Of Course I Still Love You” left Port Canaveral several days ahead of the planned Oct. 30 launch and may be prepositioned in the Atlantic Ocean some 400 miles (600 km) off the US East coast, just waiting for the boosters approach and pinpoint propulsive soft landing. The path to an October launch trifecta from Florida’s Spaceport was cleared following SpaceX’s successful static fire test of the Falcon 9 boosters first stage engines this past Thursday afternoon, Oct. 26. To date SpaceX has accomplished 18 successful landings of a recovered Falcon 9 first stage booster by land and by sea. PORT CANAVERAL/KENNEDY SPACE CENTER, FL – The now twice flown SpaceX first stage booster that successfully delivered the SES-11 UHDTV satellite to orbit at sunset Wednesday, Oct 11, sailed proudly back home into Port Canaveral during a beautiful Sunday sunrise, Oct. 15 only three days after it safely landed on a tiny droneship at sea. The booster arrival also took place just hours after a ULA Atlas launched the covert NROL-52 surveillance satellite for the US National Reconnaissance Office (NRO) – making for a nonstop day of space action on the Florida Space Coast. The 156-foot-tall Falcon 9 booster accomplished a precision guided rocket assisted touchdown on the football field sized OCISLY droneship platform about 8 minutes after the dinnertime liftoff with the private SES-11/EchoStar 105 communications satellite on Oct. 11 at 6:53 p.m. EDT from seaside Launch Complex 39A at NASA’s Kennedy Space Center in Florida. The 15 story tall first stage came to rest slightly tilted a few degrees, similar to at least two prior boosters that soft landed upright on OCISLY while prepositioned several hundred miles off shore of the Florida peninsula in the Atlantic Ocean. The recycled booster was towed into Port Canaveral by a SpaceX contracted tugboat accompanied by a small fleet of pilot ships and support vessels. The doubly used and doubly successful booster entered the mouth of Port Canaveral around 7:15 a.m. EDT Sunday under dawns delightful twilight I witnessed from Jetty Park and beach together with a few space media colleagues and a small crowd of onlookers with little fanfare. Over the next hour it was hauled through the narrow channel as numerous vessels large and small and pleasure craft sailed by, likely wondering what they were looking it. Finally the droneship platform was docked at SpaceX’s spot leased near the two huge shipping cranes dominating the scene across from popular portside restaurants – and also not far from humongous cruise ships dwarfing the booster in size. The next step was for dock workers to hoist a cap and attach it to the top of the booster. This enabled it to eventually be carefully raised off the barge with a crane by about 1 p.m. and then slowly moved and swung over and affixed onto a restraining pedestal stand on land. By the next evening Monday night, all 4 landing legs were still intact. After they are all detached the booster will be lowered horizontally aided by the cabling attached by the workers and placed on a flab bed transporter and trucked back to the Cape. However the impact of developing and reusing ‘used’ rockets is leading to an era when re-flown rockets are offered as a ‘routine service’ rather than the exception. Rocket reusability is at the heart of the extraordinary vision of billionaire entrepreneur and SpaceX CEO Elon Musk to drastically cut space launch costs and one day build a ‘City on Mars’. “As I’ve said before, I think in a couple years time you won’t even consider whether it’s a preflown rocket or a new rocket or a second time rocket,” SES Chief Technology Officer Martin Halliwell told Universe Today in a one-on-one post launch interview. The launch of EchoStar 105/SES-11 counts as only the third recycled SpaceX Falcon 9 ever to be launched and is the third successful mission with a flight-proven orbital class rocket. All three ‘flight-proven’ missions have lifted off from Pad 39A this year and all three have relanded. The Falcon 9 first stage appeared to be in good shape upon its return to Port. I did not observe noticeable significant damage to the outside of the booster skin, grid fins or landing legs. Scorching seemed comparable to the first two reflown boosters. This booster originally flew on the NASA Dragon CRS-10 resupply mission to the International Space Station in February of this year. On arrival it was clearly anchored to the OCISLY droneship deck with multiple chains as previously done for droneship landings as well as with what appears to be several gripper arms. OCISLY, which stands for “Of Course I Still Love You,” had departed Port Canaveral several days ahead of the Oct. 11 launch and was prepositioned in the Atlantic Ocean off the US East coast, just waiting for the boosters 2nd approach and pinpoint propulsive soft landing. SES was the first company to ever fly a payload on a ‘flight-proven’ Falcon 9. The SES-10 satellite lifted off successfully this spring on March 30, 2017. The second reflown booster successfully launched the BulgariaSat-1 a few months later. NASA is also assessing whether to utilize a reflown booster on upcoming ISS resupply missions – starting with the next flight of the Dragon CRS-13 cargo ship which may liftoff as soon as early December. 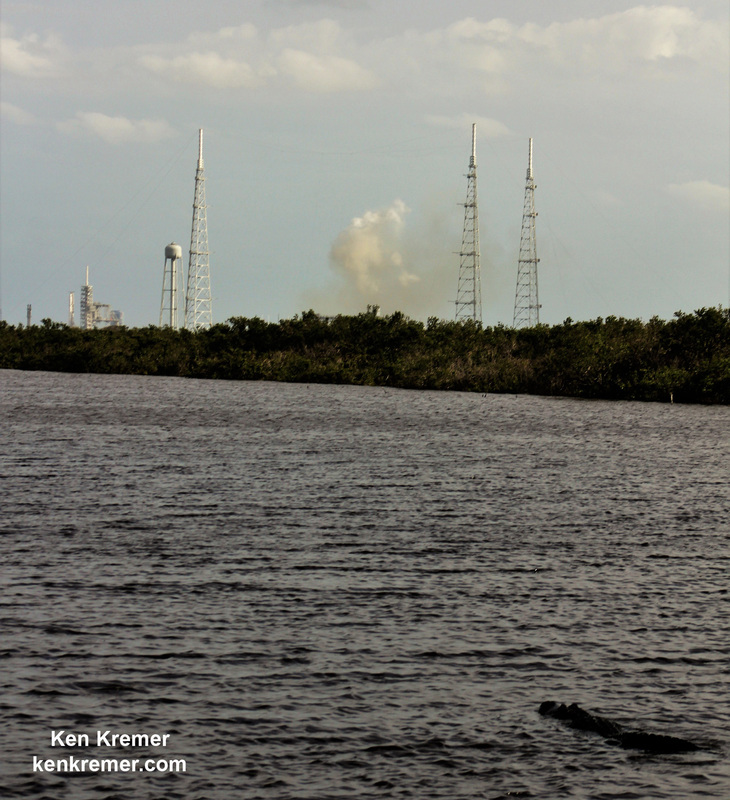 Watch for Ken’s continuing onsite coverage of SpaceX SES-11, ULA NROL-52 and NASA and space mission reports direct from the Kennedy Space Center and Cape Canaveral Air Force Station, Florida. The private SES-11/EchoStar 105 communications satellite mission soared to space with an on time liftoff of the recycled SpaceX Falcon 9 first stage at dinnertime Wednesday Oct. 11 at 6:53 p.m. EDT from seaside Launch Complex 39A at NASA’s Kennedy Space Center in Florida. Plus its saving SES “months of time” and thereby “tens of millions of dollars of real money” to fly with a used booster rather than having their expensive satellite sit and languish uselessly on the ground. SES-11 is primarily intended to significantly upgrade SES capabilities to transmit Ultra High Definition (UHD) TV signals or 4 K vs. standard HDTV – thereby pulling in more revenue streams. SES made rocket history jointly with SpaceX earlier this year when they became the first company ever to agree to fly a payload on a recycled liquid fueled rocket that SpaceX’s billionaire CEO Elon Musk dubs ‘flight-proven’. And Halliwell, as SES Chief Technology Officer, was instrumental in partnering with SpaceX CEO Musk to take a big leap make that happen. The maiden ‘used’ Falcon 9 lifted off successfully with the SES-10 satellite and delivered the comsat to geostationary orbit on March 30, 2017 – in a monumental space achievement. “The more that we looked at it and the transparency we’ve gotten from SpaceX, working together with them we were convinced of the ‘flight worthiness’ of the Falcon 9 vehicle,” Halliwell told me. SpaceX successfully delivered the 5.7 ton EchoStar 105/SES-11 joint mission satellite for SES and EchoStar to geostationary transfer orbit some 22,000 miles (36,000 kilometers) above the equator. EchoStar 105/SES-11 is a high-powered hybrid Ku and C-band communications satellite launching as a dual-mission satellite for US-based operator EchoStar and Luxembourg-based operator SES. How exactly does Halliwell and SES assess whether its worth taking a gamble on a ‘flight-proven’ booster to ensure it meets the high standards expected and really is robust and reliable and not end in disaster? How did the booster fare after the first reflown mission for SES-10? Halliwell explained that SES employs a team of engineers embedded with SpaceX. Why did SES decide on using a pre-flown booster? Did it save time or money for SES to go with a used booster? So it turns out that SES got a faster trip to orbit for SES-11 and that in turn quickly translates into real money generated instead of more money wasted with a satellite parked somewhere in a storage shed for half a year of more. The actual savings on a launch was not that big. “The average launch delay we have right now is about 7 months,” Halliwell explained. How much money does waiting around on the ground with a fully ready to launch spacecraft cost? So with SES-11 now safely in orbit it will soon be generating revenue to recoup all the investments thus far accrued. Is the era of reliable rocket reusability coming even sooner than some had expected? “I think so certainly for SpaceX,” Halliwell responded. Is SpaceX actually saving money? The company sunk huge sums of its own money amounting into the hundreds of millions of dollars to develop the reusability technology. The advertised cost of a SpaceX launch is about $61 million. Elon Musk routinely promotes the reusability technology as a means to drastically reduce space launch costs. Thus SES CEO Karim Michel Sabbagh is looking for a reduction to about half that advertised price, in the neighborhood of $30 million. To date Musk has only offered a marginal reduction to the contact price, citing the high development costs. Musk has even joked that he should charge more for a reliable ‘flight-proven’ booster. Halliwell says the real benefit thus far is the earlier launch date. SpaceX has a huge backlog of over 50 contracted launches that only grew longer following a pair of rocket explosions that forced launch delays while the firm investigated root causes. What does Halliwell think is realistic regarding pricing and achieving the $30 million target? The first stage stands 156 feet tall. KENNEDY SPACE CENTER, FL – SpaceX is all set for a sunset blastoff Wednesday, Oct. 11 of the commercial SES-11/EchoStar 105 Ultra High Definition (UHD) TV satellite serving North America on a ‘used’ Falcon 9 booster from the Florida Space Coast – that is also targeted to re-land a second time on an sea going platform off shore in the Atlantic. Spectators should enjoy a spectacular view of the SpaceX Falcon 9 dinnertime launch with a forecast of extremely favorable weather conditions. This comes on the heels of multiple deluges of torrential rain that twice scrubbed last week’s launch of a United Launch Alliance V carrying a USAF spy satellite. The private SES-11/EchoStar 105 communications satellite mission will launch on a ‘flight-proven’ booster and is slated for a dinnertime liftoff on Oct. 11 at 6:53 p.m. EDT from seaside Launch Complex 39A at NASA’s Kennedy Space Center in Florida, carrying the SES-11. All systems are GO at L Minus 1 Day! “#EchoStar105 is targeted for launch Oct. 11 from launch Complex 39A at NASA’s Kennedy Space Center in Florida-launch window 6:53-8:53 PM EDT,” EchoStar tweeted today. “Getting Echostar-105/#SES11 ready for launch!” SES tweeted further. If all goes well this will be the second launch for SpaceX this week following Monday’s Falcon 9 launch from Vandenberg AFB, Ca carrying 10 Iridium-NEXT satellites to orbit – and a record setting 15th of 2017! The used two stage 229-foot-tall (70-meter) Falcon 9 rocket was rolled out to pad 39A today, erected to vertical launch position and is now poised for liftoff Wednesday. It will launch the two and a half ton EchoStar 105/SES-11 to geostationary orbit some 22,000 miles (36,000 kilometers) above the equator. SpaceX will also attempt to recover this recycled Falcon 9 first stage booster again by soft landing on a droneship platform prepositioned hundreds of miles off shore in the Atlantic Ocean – some 8 minutes after blastoff. Spectacular weather is expected Wednesday for space enthusiasts gathering in local regional hotels after traveling here from across the globe. Playalinda Beach is among the best places to witness the launch from – while surfing the waves too – if you’re in the area. You can watch the launch live on a SpaceX dedicated webcast starting about 10 minutes prior to the 6:53 pm EDT or 10:53 pm UTC liftoff time. The two hour long launch window closes at 8:53 p.m. EDT. The weather outlook is currently exceptional along the Florida Space Coast with a 90% chance of favorable conditions at launch time according to U.S. Air Force meteorologists with the 45th Space Wing Weather Squadron at Patrick Air Force Base. The primary concerns on Oct. 11 are only for Cumulus Clouds. The odds remain high at 90% favorable for the 24 hour scrub turnaround day on Oct. 12. After the 156 foot tall first stage booster complets its primary mission task, SpaceX engineers seek to guide it to a second landing on the tiny OCISLY drone ship for a soft touchdown some eight and a half minutes after liftoff. OCISLY or “Of Course I Still Love You” left Port Canaveral several days ahead of the planned Oct. 11 launch and is prepositioned in the Atlantic Ocean some 400 miles (600 km) off the US East coast, just waiting for the boosters 2nd approach and pinpoint propulsive soft landing. The EchoStar 105/SES-11 spacecraft was built by Airbus and shipped from the Airbus facilities in Toulouse, France to Cape Canaveral, FL for flight processing. The satellite is scheduled to be deployed approximately 36 minutes after liftoff. “SES-11 is a high-powered communications satellite designed to especially accelerate the development of the US video neighbourhood, and the delivery of HD and UHD channels. Optimised for digital television delivery, SES-11 joins SES-1 and SES-3 at the centre of its robust North American orbital arc, which reaches more than 100 million TV homes. Together with SES-1 and SES-3, SES-11 will be utilised for the expansion of the North America Ultra HD platform,” according to SES. The path to launch was cleared following last weeks successful static fire test of the first stage engines Falcon 9. During the Oct. 2 static fire test, the rocket’s first and second stages were fueled with liquid oxygen and RP-1 propellants like an actual launch, and a simulated countdown was carried out to the point of a brief engine ignition. The hold down engine test with the erected rocket involved the ignition of all nine Merlin 1D first stage engines generating some 1.7 million pounds of thrust at pad 39A while the two stage rocket was restrained on the pad – minus the expensive payload. Following the hot fire test, the rocket was rolled back to the processing hangar located just outside the pad perimeter fence. The 5,200 kg (11,500 pounds) satellite encapsulated inside the payload fairing was then integrated with the Falcon 9 rocket. This is only the third recycled SpaceX Falcon 9 ever to be launched from Pad 39A. This Falcon 9 booster previously flew on SpaceX’s 10th resupply mission to the International Space Station (CRS-10) in February of this year and made a ground landing at the Cape at LZ-1. The last SpaceX Falcon 9 launch from KSC took place on Sept. 7 carrying the USAF X-37B military space plane to orbit just ahead of Hurricane Irma. PLAYALINDA/KENNEDY SPACE CENTER, FL – SpaceX is targeting Saturday Oct. 7 for blastoff of the SES-11/EchoStar 105 commercial telecomsat following a successful static fire test of the first stage engines of the ‘used’ Falcon 9 booster, as a Florida Space Coast gator gazed on in wondrous glee as the engines fired away Monday afternoon, Oct. 2. The brief engine test took place at 430 p.m. EDT (2030 GMT) Monday Oct. 2, with the sudden eruption of smoke and ash rushing out the north facing flame trench and into the air over historic pad 39A on NASA’s Kennedy Space Center during a windy and overcast afternoon – as I witnessed from the Playalinda Beach causeway FL with the jet black hungry gator just feet away from me in the inland waterways. The static fire test lasted approximately three seconds. The test is routinely conducted by SpaceX engineers to confirm the rockets readiness to launch. In this case the SpaceX Falcon 9 will refly and relaunch as a recycled rocket. 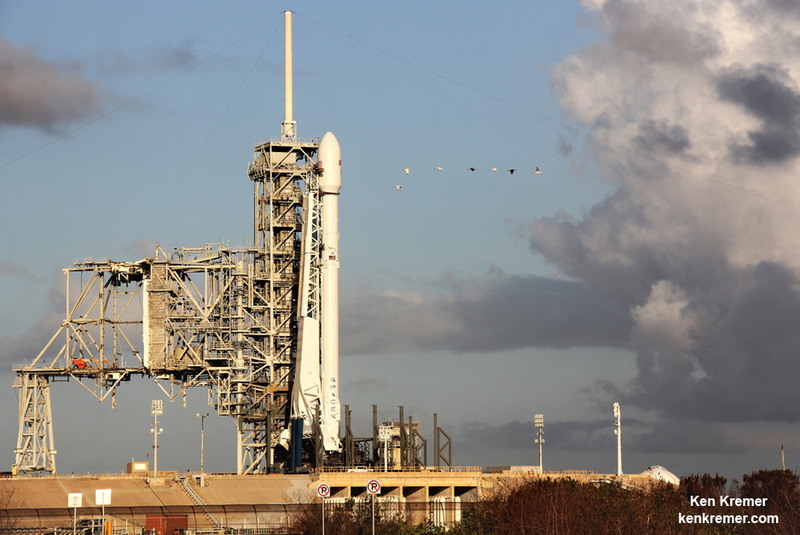 “Static fire test of Falcon 9 complete,” SpaceX confirmed via tweet soon after the hotfire test was conducted. The private SES-11/EchoStar 105 mission will launch on a ‘flight-proven’ booster and is slated for a dinnertime lift off on Oct. 7 at 6:53 p.m. EDT from seaside Launch Complex 39A at NASA’s Kennedy Space Center in Florida, carrying the SES-11 telecommunications payload. SpaceX will also attempt to recover this booster again by soft landing on an ocean going platform prepositioned in the Atlantic Ocean- about 8 minutes after blastoff. It will be launched to geostationary orbit some 22,000 miles (36,000 kilometers) above the equator. During Monday’s static fire test, the rocket’s first and second stages are fueled with liquid oxygen and RP-1 propellants like an actual launch, and a simulated countdown is carried out to the point of a brief engine ignition. The hold down engine test with the erected rocket involved the ignition of all nine Merlin 1D first stage engines generating some 1.7 million pounds of thrust at pad 39A while the two stage rocket was restrained on the pad. Playalinda Beach is a spectacular place to witness the launch from – while surfing the waves too – if you’re in the area. The Beach survived Hurricane Irma but suffered serious erosion. However many favored launch viewing locations were decimated by the Irma’s wind and crashing waves and flooding – as I reported here earlier. This launch is the first for SpaceX from KSC in the aftermath of Hurricane Irma which forced the center and Cape Canaveral Air Force Station to close several days and postponed this liftoff. EchoStar 105/SES-11 provides EchoStar with 24 Ku-band transponders of 36 MHz, marketed as EchoStar 105, while it provides SES with a C-band payload of 24 transponders, marketed under the name SES-11, says SES. EchoStar 105/SES-11 replaces Ku-band capacity for AMC-15 and C-band capacity for AMC-18 at SES’ well-established 105 degrees West orbital slot. SES-11 is the 47th satellite based on Airbus’s highly reliable Eurostar E3000 platform. The engine test was carried out without the expensive payload attached to the top – a measured instituted since the catastrophic launch pad explosion and loss of the AMOS-6 commercial payload. Following the hot fire test, the rocket is rolled back to the processing hangar located just outside the pad perimeter fence. The 5,200 kg satellite will now be integrated with the rocket for the planned weekend liftoff. The solar arrays generate a spacecraft power of 12 kW. Watch for Ken’s continuing coverage direct from onsite at the Kennedy Space Center press site and Cape Canaveral Air Force Station.